A group of young Italian students spent two weeks working in local businesses in Athlone recently, as part of a programme organised by Shannon Academy of English. 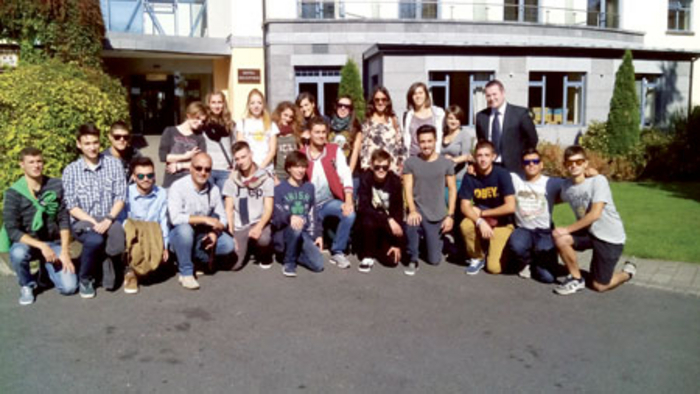 The group of 21 students, aged between 18-21, travelled to Athlone with their leader Giuseppe Porcu. They came from schools in four different towns in Italy - Cagliari, Sassari, Alghero, and Torino. During their three-week stay, they attended language classes at Shannon Academy for the first week and did work placements in local businesses for the following two weeks. While staying in Athlone the group also took part in activities such as visiting local attractions like Athlone Castle and Clonmacnoise, and trips to Dublin and Galway. Shannon Academy of English, in conjunction with Sapeiri Di Sapori, would like to thank the following businesses for their support in this project: Meares Dental Surgery, Mark Cooney Solicitors, Athlone Printing.com, Mike Ganly Auctioneers, Sean’s Bar, Murphy’s Law, A Slice of Life, Burgess Department Store, Lennon Fair Deal Tyres, Au Naturel, The Honey Pot, Coffee Haven, Poppyfields, Corner House Bistro, Athlone Castle, Hynes Auctioneers, Electro Direct, and B-Tech Computers. They would particularly like to thank the Shamrock Lodge Hotel, where the group stayed, for their hospitality.